Another powerful collision of galaxy clusters has been captured with NASA's Chandra X-ray Observatory and Hubble Space Telescope. Like its famous cousin, the so-called Bullet Cluster, this clash of clusters provides striking evidence for dark matter and insight into its properties. Like the Bullet Cluster, this newly studied cluster, officially known as MACS J0025.4-1222, shows a clear separation between dark and ordinary matter. This helps answer a crucial question about whether dark matter interacts with itself in ways other than via gravitational forces. This finding is important because it independently verifies the results found for the Bullet Cluster in 2006. The new results show the Bullet Cluster is not an exception and that the earlier results were not the product of some unknown error. Just like the original Bullet Cluster, MACS J0025 formed after an incredibly energetic collision between two large clusters in almost the plane of the sky. 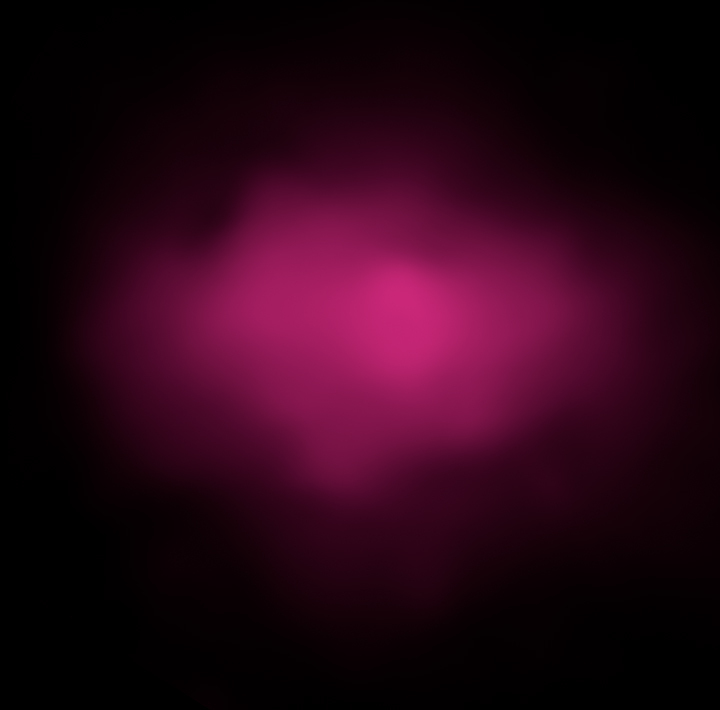 In some ways, MACS J0025 can be thought of as a prequel to the Bullet Cluster. At its much larger distance of 5.7 billion light years, astronomers are witnessing a collision that occurred long before the Bullet Cluster's. An important difference between the Bullet Cluster and the new system is that MACS J0025 does not actually contain a "bullet". 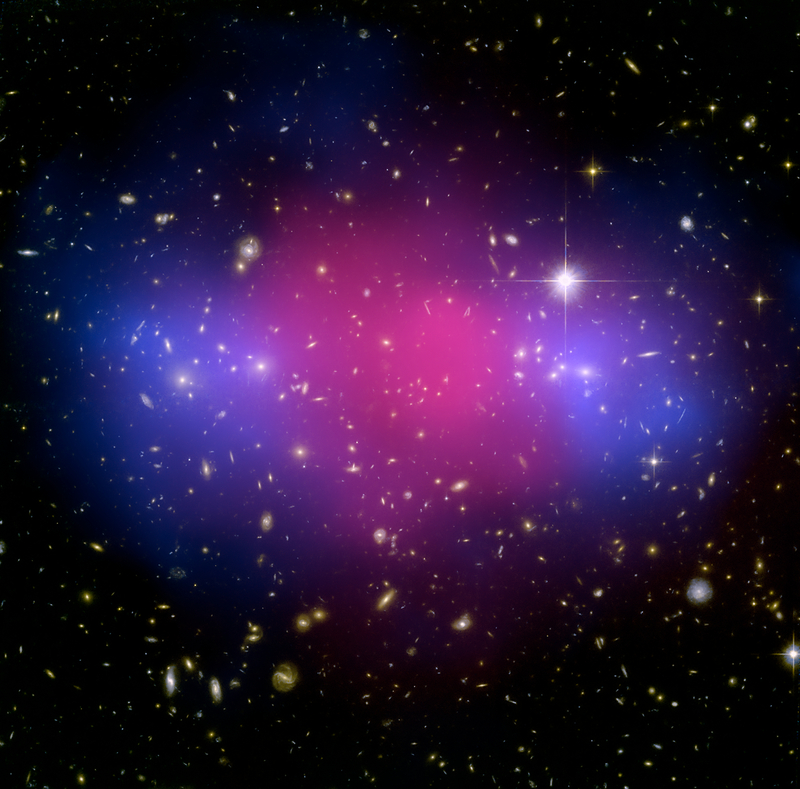 This feature is a dense, X-ray bright core of gas that can be seen moving through the Bullet Cluster. Nonetheless, the amount of energy involved in this mammoth collision is nearly as extreme as that found in the Bullet Cluster. As the two clusters that formed MACS J0025 (each almost a whopping million billion times the mass of the Sun) merged at speeds of millions of miles per hour, the hot gas in each cluster collided with the hot gas in the other and slowed down, but the dark matter did not. The separation between the material shown in pink and blue therefore provides direct evidence for dark matter and supports the view that dark matter particles interact with each other only very weakly or not at all, apart from the pull of gravity. One of the great accomplishments of modern astronomy has been to establish a complete inventory of the matter and energy content of the Universe. The so-called dark matter makes up approximately 23% of this content, five times more than the ordinary matter that can be detected by telescopes. The latest results with MACS J0025 once again confirms these findings. The international team of astronomers in this study was led by Marusa Bradac of the University of California Santa Barbara (UCSB), and Steve Allen of the Kavli Institute for Particle Astrophysics and Cosmology at Stanford and SLAC. Their results will appear in an upcoming issue of The Astrophysical Journal. Other collaborators included Tommaso Treu (UCSB), Harald Ebeling (University of Hawaii), Richard Massey (Royal Observatory Edinburgh), and R. Glenn Morris, Anja von der Linden, and Douglas Applegate (Stanford). Scale Image is 3.2 arcmin across. Coordinates (J2000) RA 00h 25m 29.80s | Dec -12° 22´ 47.00"